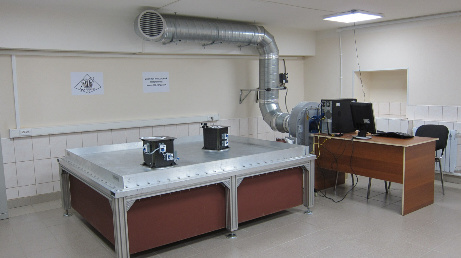 Keldysh Institute of Applied Mathematics and the Sputnix Ltd develops a laboratory facility for study and verification of motion control algorithms. The facility is a bench with an air cushion on it allowing control system mock-ups to move freely over the plate almost without friction. 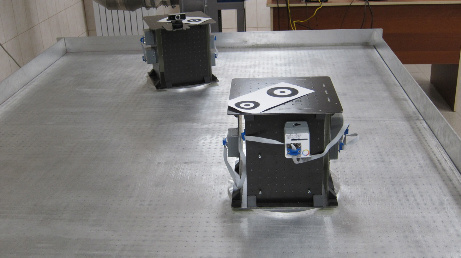 The mock-ups motion control is carried out by thruster simulators. During the internships organized by the German Agency for Academic Exchanges (DAAD) students and postgraduate students of the Moscow Institute of Physics and Technology (MIPT) participated in development and verification of satellite mock-ups motion control algorithms in the Center of Space Technology and Microgravity (ZARM) in Bremen. The LuVeX facility consists of a bench with glass surface and two mock-ups. A starry-sky simulator (LEDs ceiling) and a web camera were used for attitude motion determination.